FINALLY! A trip this year to the Philippines that didn’t include Boracay and Palawan. I’ve already mentioned in another blog post that I have a bad habit as a traveler of going back to familiar places over and over again instead of exploring somewhere new. But this year, although it was (freakin’) hard, I finally committed to other popular destinations in the Philippines that I’ve been longing to explore, such as Bohol and Cebu. But my travel buddies and I only had 5 days total to explore Bohol and Cebu! We took off from Manila at 12:15 p.m. but didn’t get to our hotel in Oslob until around 9:00 p.m. 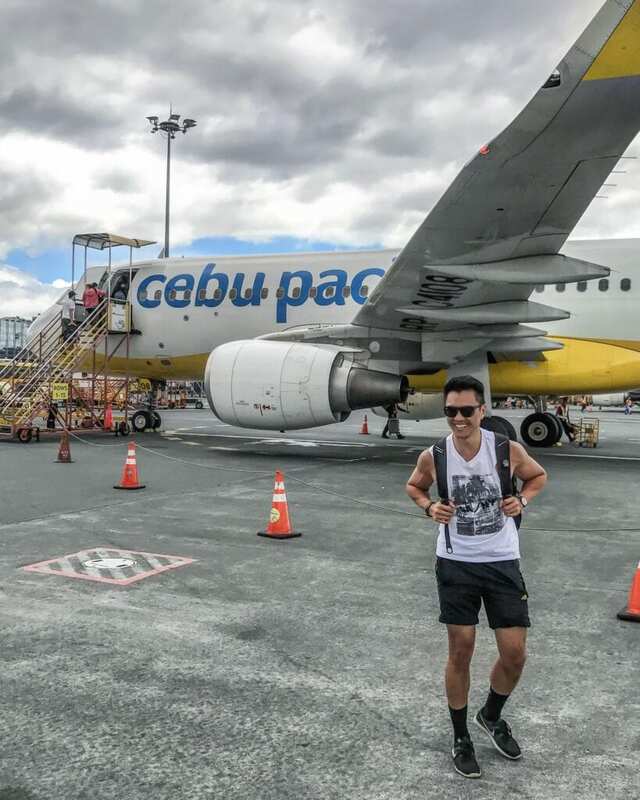 The flight from Manila to Cebu City (via Cebu Pacific) takes just over an hour. But, as in many cases when you travel in the Philippines, the transfer time from place to place is longer than the actual flight itself. We landed in Cebu City just after 1:30 pm and immediately went to a restaurant that specializes on the regional cuisine: Lechon! If you’ve ever been to a Filipino house gathering, you know that this a staple food item on the table (would be kind of hard to miss with that giant roasted pig staring right at you). Shortly after lunch, we had another three hour bus ride from Cebu City to Oslob. It was probably around 9 p.m by the time we got all settled in our hotel. Looking back, it probably wasn’t the most ideal itinerary especially if you only have a few days for the total trip! We started bright and early considering our packed itinerary for the day. We woke up at around 6:30 a.m. to swim with whale sharks, then went straight to Kawasan Falls just after breakfast and took a ferry to a neighboring island Dumaguete. Unexpectedly, swimming with whale sharks has become one of my top five travel activities to date considering my lack of skills staying afloat in the water (aka I don’t know how to swim). Before we got in the boats, an instructor gave a 10-minute safety and regulation speech on how to interact with whale sharks. At this point, I was doubting my judgement on whether or not there was any point of going in, given the fact I’m an adult man who doesn’t know how to tread water. I went in anyway. While everyone was jumping off carefree and swimming around and getting their pictures taken and Gopro-ing with whale sharks, I was still in the boat with the life vest on (man child alert) contemplating on whether or not to go in. But I also wanted my pictures taken to remember this amazing experience with whale sharks in Cebu. So I went in! #MomBeProud! As you can imagine, you need to be submerged in the water in order to take be in the same picture as a whale shark. Thanks for the push, kuya! Shortly after swimming with the whale sharks and having breakfast, we went straight to Kawasan Falls. To get to the two-hour trek from Oslob to Kawasan, we rented a private limo (…or jeep) for just $14 USD per person (there were four of us). Not a bad deal considering we had a private chauffeur for the whole day! What struck me the most was the beautiful scenery the moment we got our first glimpse of Kawasan Falls. Just imagine the clearest turquoise water possible, surrounded by lush tropical greenery, and the natural and relaxing sound of a waterfall gushing down from soaring heights. 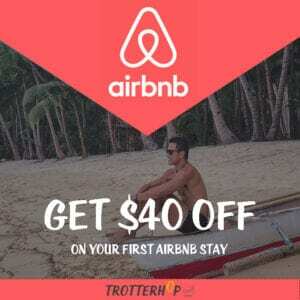 A treat for every fan of ecotourism. It is very touristy – flocked by foreigners and locals alike. So be prepared by the sheer amount of people swimming with you at the lagoon. If you want to do more of a physical activity besides sitting around the falls, you can do the two-hour canyoneering in Kawasan falls! If you want to escape tourists in the main lagoon, there are different falls in the vicinity for you to enjoy. There are outdoor seating and a restaurant at Kawasan. The trail just to get to the falls is beautiful in itself. Make time to enjoy the scenery of getting there as well. No shortage of palm trees here! We had quite the journey to get to Bohol. We spent the night on the neighboring island of Dumaguete, where we took the ferry the next morning to the tiny and mysterious island of Siquijor before reaching Bohol. I wasn’t actually aware of the folklore and mystery surrounding Siquijor until we reached Cebu. The locals gave us their warning with their stories about mysterious events that happens in Siquijor. 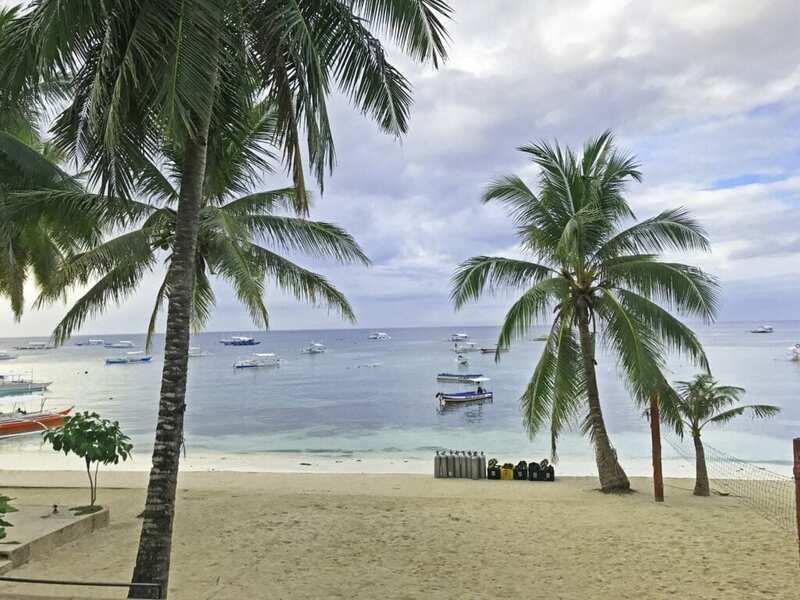 Siquijor, for many Filipinos, is the island of sorcery and witchcraft. Legend has it that there are two kinds of witches that exist in the island: a bad one and a good one. One of them is called mambabarang (or local sorcerer), who uses their power to cause pain and disease. The other is called mananambal (or shamans), who are known to use their magic and witchcraft to heal illnesses and diseases. Needless to say, we became slightly excited (…ok, maybe a bit nervous) about the prospects of running into a witch on that tiny island. Besides the folklore, Siquijor left quite a positive impression for the less than two hours we spent on that island. 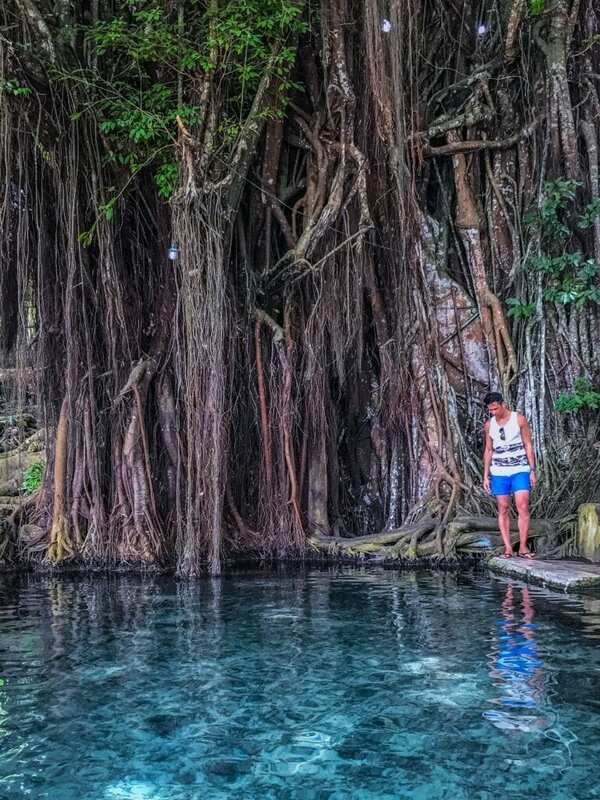 Unfortunately, we were only able to visit the stunning Cambugahay Falls and the mysterious Balete tree due to our very tight schedule. We wish we stayed longer. I think another trip to Siquijor will definitely be on the itinerary on the next visit to the Philippines. We didn’t see many tourists roaming around, which is a good indication of finding plenty of beaches all to yourself! Our only full day in Bohol! We arrived the night before, but just ended up having dinner right along the beach and went straight to bed (either due to food coma from the dinner buffet or traveling extensively all day… or both. Probably both). So the first thing to check-off the bucket list in Bohol? 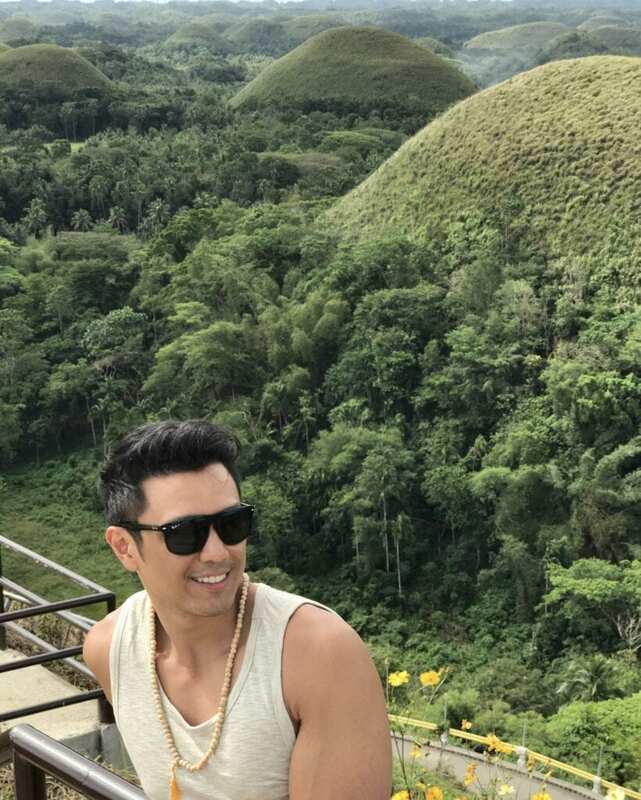 The Chocolate Hills! Getting to Chocolate Hills was kind of a trek from our hotel in Bohol. We rented a private car that took approximately one hour and thirty minutes to and from the Chocolate HIlls (not to mention the price: all for just under $24 USD)! The Chocolate Hills are the island’s most famous tourist attraction. They are a geological wonder, composed of 1,260 hills that look like chocolate truffles in various sizes – spread over an area of 50 square kilometers or more. I’ve always seen pictures of these natural wonders in postcards, so to see them for the very first time as we approached the view point was quite breathtaking. Since we left quite early to visit Chocolate Hills, we were back in Alona Beach to join the rest of the group by 11 a.m. just in time to do a second activity in Bohol. We rented a private boat for our little island hopping – all for 3,000 Philippine peso, or 600 pesos for five people. DAY 5 – BYE BOHOL! Not much to write here except this was the day when our little group split apart. Traveling with this group was a definite highlight of my trip to Asia this year. What you may not know is that we all, more or less, met each other recently. I met Andrew (from San Francisco) through Joyce (from New York), who I met through instagram. Andrew and Joyce met Guillaume (from Paris), who I met during my trip to Palawan last year. My friend Ryan (from Chicago) met everyone for the first time on this trip. We shared some amazing memories during this trip – and I think we are all already looking forward to exploring the rest of the island next year!! Wow! This is awesome! Your photos are amazing with the whale sharks. Great blog!